Jagte Raho has to be ranked amongst the best of not only Raj Kapoor's performances, but also among the best Hindi films of any time. A satirical look at the Bengali society of the time, it could have been transposed to virtually any teeming metropolis without losing its relevance. This was RK at the height of his prowess as producer and actor. 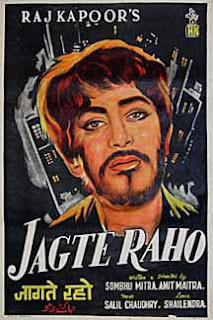 An allegorical tale that uses darkness and light to rip off the mask of respectability worn by the moral pillars of society, Jagte Raho tells the story of the plight of one man, who, pilloried as a thief and chased by the 'upright' middle class citizens of the society, finds far worse crimes hidden behind closed doors. A poor villager (Raj Kapoor), generic and therefore nameless, comes to the city in search of employment. Arriving at night, thirsty and hungry, he finds the city heartless, the night watchmen exhorting him to move along as he tries to get a drink from a fire hyrdrant, and threatening to break his bones if he doesn't. In a beautiful scene that sets the tone for the rest of the movie, he makes friends with a street dog, the only friendly face that he finds, sharing his handful of channa with him. As they share their meagre repast, a dilettante weaves into view - the delightfully drunk (Motilal), who offers him alcohol much to the villager's bemusement. When he returns the drunkard's wallet, the cynical city dweller is surprised. A surprise that turns into incredulity that the villager neither drinks nor smokes nor gambles, but only wants some water to quench his thirst. The villager is left to wander the city roads in search of water. He comes across his canine friend again, this time lapping water up in the courtyard of a residential complex. His thirst overcomes his natural diffidence at entering such a grand building, but he is seen by the night watchman who raises the alarm. Thus begins a night of sheer terror for the simple man. The ensuing hue and cry awakens the residents, and the able-bodied and hot-blooded amongst them form a posse to hunt the thief down. Frightened by the noise, the villager begins to run. As the men following begin to bicker about whether the thief is armed or not, the poor target climbs up to the first floor, and then seeks refuge in one of the flats. He is overjoyed to see a bucket of water, but before he can drink, he is interrupted again. It's a pair of lovers who are caught in a conundrum - if her father wakes up, she will be shamed; if he goes out, he will be beaten up by the mob downstairs. Their easy promises to each other are soon shorn of the glitter. As the mob chases the embattled lover, chaos ensues, and lover and villager find themselves on the same side. As vigilante justice is meted out to an unsuspecting bystander, the lover, Pradeep (Pradeep Kumar), in order to hide the truth of his own perfidy, is forced to help the alleged thief escape. But the poor man's ordeal is not yet over. Caught in the maze of buildings, he blunders around looking for a way out. Soon, he is on the run once again. Caught in a cul-de-sac, he desperately looks around for an avenue of escape; finding another open door, he barely manages to hide himself before his pursuers show up. Hidden, he is amazed witness to what happens next. He manages to prevent the crime but is not prepared for the furore that ensues or for its consequences. As the cat-and-mouse game continues, the villager-on-the-run once again runs into the dilettante, much to the latter's amusement. Forced to accompany him, the villager is witness to another scene in the drama of life. When at last he is thrown out, he hides in a most unlikely place. As the residents fight about him, and over him, and around him, he tries to make his escape. This time, his attempts seem futile. Like a cornered rat, he runs through one corridor to another, climbs one floor after another, and is balked at every step. Is it all over for him? It has already been established that he is a thief; will this vigilante mob even give him a chance to protest his innocence? And now the police and the press are involved, bringing even more illegal activities to light. The film unwinds slowly over the length of one night, but gains momentum as the protagonist moves from flat to flat to escape his tormentors who chase him as a thief. And in his seemingly futile attempts, uncovers a multitude of sins / vices, ranging from petty thievery to adultery to bootlegging to counterfeiting; he will even masquerade as a corpse! Not to speak of meeting people who want to turn that masquerade into reality and are willing to go to any lengths to do so. Raj Kapoor had very few dialogues in the film - his fear, his pain, and his helplessness were vividly etched on his face, and mirrored in his eyes. This was truly a class act from the master filmmaker, who also had the guts to produce this modern fable. He was supported by a fine ensemble cast, of whom special mention must be made of Motilal, who plays the drunken debauch with great élan, and a very young Iftekhar, who plays Sandow, the hot-headed leader of resident youth. One of the few RK films that did not have house-favourites Shankar-Jaikishen, the musical score by Salil Choudhary, was used sparsely and with great effect. The film opens with the jaunty, if sybaritic, Zindagi khwaab hai and ends with the haunting Jaago Mohan pyaare. Each song pulls the narrative along convincingly, and the background score is perfectly in sync with the story. Based on a Bengali play Ek Din Ratrey, and directed by Bengali greats (actor-director) Shombhu Mitra and Amit Maitra (they also wrote the story), the Bengali version (also titled Ek Din Ratrey) had Chhabi Biswas playing the role that Motilal assumed in Jagte Raho. A shortened version of Jagte Raho (115 minutes) won the Grand Prix at the Karlovy Vary International Film Festival. This was also the last time Nargis appeared in a RK film, a banner that she had, until then, called her own. Oh, then you know what? A couple of months later I saw the same store selling that 5 CD thing for Dev's songs, and... hehehe. :D But I made sure that Disc 5 disappeared because it had all his horrible later songs! This was probably RK's finest movie, and he thought so too. In fact, I remember reading an interview where he said that just as a parent always has a soft corner for the child who doesn't do well in life, he had a soft corner for this movie, even though it was not the commercial success it deserved to be. I love the songs "jaago mohan pyare ..." and "Zindagi khwab hai ..." as well as the "Duniya deve duhai ..." song. I used to wish that RK had continued to make movies like this, rather than stuff like Sangam, which had good music but was still purely commercial rather than artistic. By the time Sangam rolled around, he was jaded, and cynical. Also, remember that the cinema scene had also changed. No one wanted 'realism' anymore. This was the escapist 60s where colour had come in and changed everything. So, locales, beautiful heroines, pretty heroes and fluffy scripts became the order of the day. Also, the distributors started exercising more power, and pleasing the 'box-office' became the order of the day. Which is actually why he made Mera Naam Joker - it was his last hurrah - a stand against mammon. Unfortunately, that tanked! And that took care of any more artistic endeavours on his part. He almost lost RK Studios post Joker. Oh, you should, Banno! There's so much humour too, and it is not at all a preachy film, though obviously, there is a message. I know... as much as I like Sangam, some parts just creeped the hell out of me. And... I was kind of surprised, last time I had watched it because... I loved the songs and I had no special attachment to anyone in the film... but seriously, the part before "Main Kaa Karoon Ram" just... I was staring at the screen and didn't know how to react. I have been intending to watch this for so long! Though I do not care much about Raj Kapoor or most of his movies(especially his naive tramp act), I managed to stay through Jagte Raho because I found the supporting characters much more intriguing and more interesting than "you know who". But again, I might be wrong as it has been a while since I saw the movie. Thinking back, Salil Choudhury`s music is all I can remember today. Jagte Raho is also considered a landmark film by many because it symbolizes the end of Raj Kapoor-Nargis dream association which lasted for 8 years through 16 movies. I guess after igniting his passion in "Aag" all the way back in 1948, Nargis finally decided to quench his thirst and walk away singing "Jaago mohan pyaare". Though, it is a diiferent story that Raj Kapoor`s thirst for "female anatomy and water" suddenly was awaken after "Jaagte Raho" and Nargis. Hmm, would you like to be strangled with a plaid scarf or a striped one? Go away! :) Though I did like your exposition about Nargis. hahaha! I really do admire your complete devotion towards everything RK. Let me tell you I am not exactly offended by the mere thought of Raj Kapoor(like many). It is just that I find some acts/traits/mannerisms of his(which later went on to define Raj Kapoor) excruciatingly painful to watch. Otherwise, I m a huge fan of RK films. Great Music, nice concept, brilliant supporting cast, technical fineness and of course pretty ladies, whats not to like in RK movies? 3>Everything from JDMGBH to Joker (except Dulha Dulhan, Dil Hi To Hai and of course Teesri Kasam). Hmm, welcome back. You forgot 'Great Scripts' and 'Excellent Direction' but I'll forgive you. :) I agree with the rest of it (not the stuff about RK, of course). I agree with 'Oh, Lord' for Kanhaiyya (nice one!) and Aah. 'Oh Lord why so much pain' made me laugh out loud! I liked parts of it, except when they stretched out the melodrama. The songs were good, though. I actually liked the first two parts of Joker. My issue with the third part was that it called for a 'girl' - someone like Nargis, for instance (though she could not have done the role of a danseuse); not Padmini, who with all due respect, could hardly pass off as a girl-disguised-as-a-boy. I must confess to liking JDMGBH, but then, I'm a lost cause. :) And he was good in Kal Aaj aur Kal. Anuji, you have done so complte justice to the movie's nuances that there is nothing left but to re-live the experience of seeing and enjoying the movie. To your attention-catching mention to "who does not drink.. thirsts for water" I would like to add my one more favourite: the song - Thandi Thandi Saawan Ki Phuhaar - Asha Bhonsle [http://youtu.be/krEJY59qYuw]. As the 'typical Indian wife' looks yearningly at husband, the pallu that was covering her head - her image of holyness(!) - moves away and seems to bare her womanly ( or for that matter , basic human) instincts, ably supported by the lyrics and wailing violins in the background support of Asha's soulful rendition. This is one of those (very few) RK films that I actually like, even though RK's character got a little irritating after a while. The premise of the movie - the so-called 'respectable' people picking on a man who wants nothing but a sip of water - is good (and the music is fantastic), but RK's tramp-like character emerges even here, and put the film in jeopardy of becoming another of the many RK films I hate. Still, far better than stuff like Aah or Chhalia, as far as I'm concerned! Thank you so much, Ashokji. It's appreciation from my readers that keeps me going. :) Thank you so much for making my day. Salilda did do a wonderful job in this film - each one of the songs was a gem. Thank you for posting this song too. Me? Stop watching Hindi films! Impossible! Never! If I stop who's gonna be up all night trying to (fail) dance like Rajendra or or or uh to make references everywhere and to dive into every store that sells scarves and all of that fun stuff? P.S. Almost 3am here and I'm still up and kicking. I feel so proud. I think I will like it! In fact I saw Awara a few days back and it was good as well. Am still ruminating over it. Anu, I'm 100% with you here. I too think it's one of the best Indian films, and Raj Kapoor's acting was superb. I had thought the film would be boring, but once I started watching it, I was hooked. many thanks for this wonderful visit through a great movie, and yes, you're right, I'm sure one day we'll win over to RK all those critics of his works!! I think the trouble with RK bashers is that they forget that the guy is out to create, not just to entertain. It's entertainment and art. Art of the most wonderful sort. Look for example at the main motif of thirst: if you pay attention to it, and watch the movie with the question "What's RK's telling me through this motif? ", you'll be able to notice layers of meaning and beauty which otherwise escape you if you focus only on RK's so-called mannerisms. They will only obscure your appreciation of what is there to be seen. Briefly then: the film opens on this thirsty gharib (why is he thirsty? why can't he drink? Why is he stopped from quenching his thirst?) He meets a drunkard (he's thirsty too, but a different liquid - what does this have to do with the theme? Clearly there's a suggestion there!) then he goes inside, and he meets other drunken people... and people who aren't thirsty, not in the least. No thirst for anything but their own private, personal, egoistic interests. So what could thirst represent, among such quenched individuals? And finally how do we interpret/appreciate the last scene where a young maid finally gives him the drink he's been "dying" for? But there's also his speechlessness: what do we make of that? Language is an all-important element in any social or moral work of art. I believe the film can and should make us peform the same quest for meaning and creativity, regarding this other very important structure. More: it would be wrong to disregard it, because there's so evidently a mystery in this silence: the film begs out open eyes, our open ears, our open heart, and not to do this task is to reduce it to a two-dimensional flat drawing which completely forgets the life which vibrates in it! The movie is called "Jagte raho", for Christ's sake! Thank you, Yves, for this wholehearted appreciation. I'm glad you enjoyed the movie and my review. You are right that when you focus only on RK's mannerisms, then the nuances are lost. Personally, I thought he didn't show his mannerism. Well at least not more than other actors (even the best - west or east) who behave and give the feeling of 'same' even if slightly (as with RK here) in all their films. The thirsty character gets so distracted with terror and what's going on around him that at least once when he could have taken at least a gulp his attention is elsewhere. I interpret this as 'forces' which will take away your attention away from your 'thirst' ( no matter how strong it is) preventing you from fulfilling it. And how do you interpret the "thirst"? Yes, I enjoyed it and availed myself of the right to quote it at the end of what I have said about it on the blog, so thanks again. @pacifist: I don't think he showed any mannerisms either, but the issue (I think) is that people got so used to those mannerisms that they 'saw' it every time they saw RK. Thirst = basic needs of all humans!! Raj Kapoor represents the poor....among the 'not poor'. Thirst = basic needs of all humans, and how difficult it is to fulfill them for some in the society? I am sure Raj Kapoor would have jumped at the offer to break his tramp image. And he's done a wonderful job. Thank you, Shashi. I'm glad you enjoyed the film and the post.